Composition doesn't have to be scary. 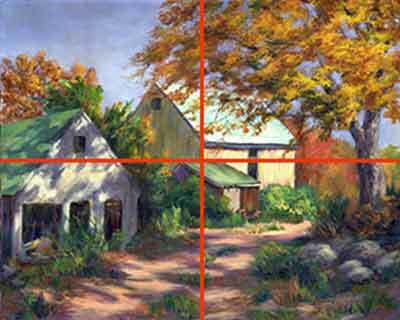 Two easy composition guidelines give you no-fail paintings. what makes a good composition in art? 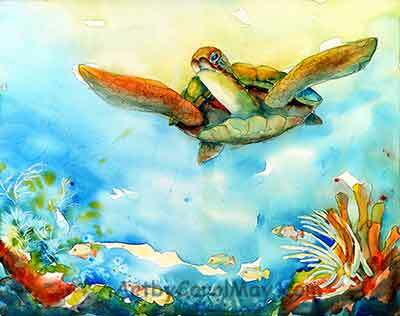 A good artistic composition has the painting elements arranged in a pleasing manner. Paintings with good composition pull the viewers in and make them feel comfortable. They will find pleasure or interest in looking at your paintings. how do i compose a painting? 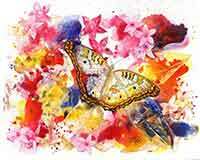 The elements of my paintings are arranged with one of the two easy rules of composition. The viewers enjoy my paintings. They feel comfortable and want to spend time looking at the paintings. Artists don't have to copy nature or photographs. 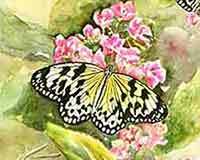 We have an artistic license to arrange the elements in our paintings to make them pleasing to the viewers. how do you compose a painting that pulls the viewer in? There are two easy, no-fail rules of composition. 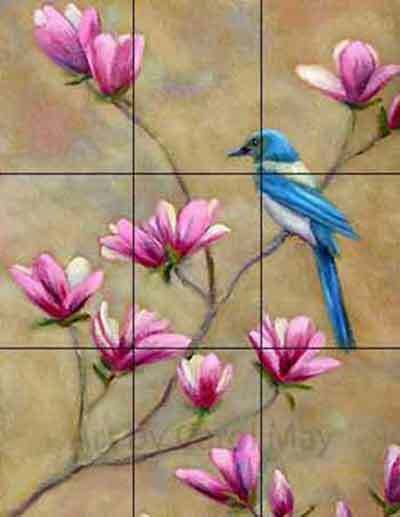 The rule of thirds is the easiest and simplest way to compose pleasing paintings. Divide your painting surface into thirds, both horizontally and vertically. Draw two lines up and down and across your painting surface. This gives you nine equal spaces. This works when your painting is oriented either horizontal or vertical. Place your focal point, the center of interest at one of the intersections. You may use any intersection, left, right, top or bottom. why do you use the rule of thirds? The focal point is never in the center of the painting. If the focal point is dead center in the middle of the painting, it is like diving into a deep hole. It is hard for the viewer's eye to move to other areas in the painting. 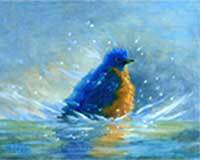 See the example of my Scrub Jay painting at the right. He is located on the intersection of the third lines. The viewer's eye is drawn into the painting and can freely move out around the rest of the painting. Position people or animals facing into the painting. Don't have them looking out the side of the painting. Their line-of-sight will carry the viewer's eye right out of the painting. Give them plenty of space in front of their face to look into the painting. The Jay in the painting above is looking into the painting. His view directs the viewer's gaze into the painting. The viewer's eye goes down to the central flower, around to the other flowers and back up the bird's tail. The eye is kept inside of the painting. The flowers by the edges of the painting are softer with less contrast, so they don't pull the viewer out of the painting. The Rule of Center Lines is a second method of easy composition. Don't put the main subject of your painting on the center lines either horizontally or vertically. The RED lines mean danger. Place the horizon line either above or below the horizontal center line. Place any main objects to the left or right of the vertical center line and above or below the horizontal line. If you put a main object on a center line, it cuts the painting right in half. 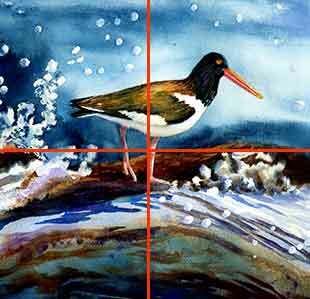 The Oyster Catcher in the painting at the right is dead-centered in the middle of the painting. Also, the centered horizon cuts the painting in half. Then the viewer sees two paintings instead of one cohesive painting. They feel uncomfortable and don't know where to look. These two mistakes make a very poor composition. Easy composition in landscapes or seascapes means always place the horizon either above or below the center line. 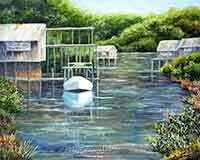 After you position the main subjects of your painting, you are well on your way to an exciting painting. Keep a few other things in mind. Vary the Sizes, Shapes and Colors. This is a very important item for easy composition. Don't repeat sizes and shapes thru-out the painting. Have large, small and medium items in the painting, never all the same size. The same goes for color. Don't have equal amounts of warm and cool colors. 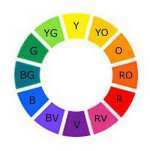 Use your dominant, focus color in a smaller amount. There will be larger amounts of the other colors. In this painting the focus color is orange. Blue and yellow are the supporting colors. Don't line up anything line up parallel with the edges of the painting. A line going directly out the side of the painting, especially out of the corners, will lead the viewer's eye right out of the painting. What about the horizon? Break the horizon line somehow, like with a bird, a tree, a mountain to keep the eye in the painting. 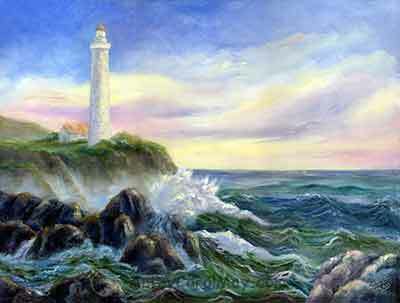 In this painting the lighthouse tilts slightly to the center of the painting. The top of the lighthouse is subdued, so it doesn't lead the viewer's eye out of the painting. Neither the lighthouse nor the horizon are on the center lines of the painting. The horizon on the right side of the canvas has less value contrast and the edges are softened to keep the viewer's eye in the painting. Shy away from using definite geometric shapes like a square, circle or triangle. They are too static and non-artistic. But what if you have a building that is rectangular, a mountain that is shaped like a triangle or a lake that is a circle? Use your artistic license and change them. Move the view of the building to change its shape. Or camouflage it with foliage or shadows, etc. Put whoop-Dee-dos in the mountain to change its shape. Make a meandering shoreline that is not a perfect circle and etc. Numbers such as three, five or seven are more pleasing to the eye. For some reason even numbers such as two, four or six are more stagnant and unexciting to the eye. So no matter if it is trees, rocks or apples - use odd numbers - that's easy composition. Things look better in groups or near other items. Single items are great for the focal area. But in other areas of the painting, items grouped together are more comfortable for the viewer. If items are touching each other, overlap them. Don't have them just barely touching, that's a tangent. Artists call that kissing. Avoid objects kissing each other or kissing the side of the canvas. Overlap them somewhat and it will be more comfortable for the viewer. you want to learn more about composition? Check out the "Mastering Composition" book. It is a hardback book that has a rating of 4.5 out of 5 stars from 141 readers. When your composition is right, your paintings just flow. The composition pulls in the viewer and they enjoy being in your painting! You can't paint without composition. Learn good composition. You are the artist! Trust yourself. Use your artistic license. With these easy composition guidelines you can change and move things around. If it looks and feel right to you, it will please the viewer. And that's what it's all about.